This adage arose during a dirtier age — then a gift of a newly industrialized society. But in the last several decades we’ve gained a much greater understanding of the ills of air pollution, and have done great things like create a cap-and-trade mechanism for sulfur dioxide and NOx to reduce acid rain. Surely that old canard only now applies to rapidly developing countries like China and India. 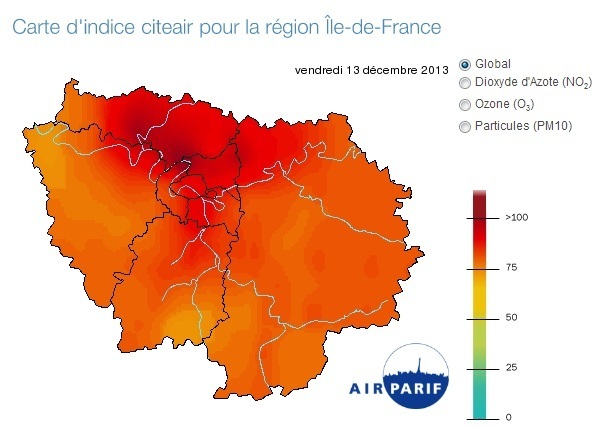 The article describes how Paris currently has a perfect storm of poor air quality. In winter, like any major urban center, Paris generates plenty of emissions from heating, industrial usage, and diesel fumes. But for this stretch, the winter climate also created meteorological conditions of cold, dry, and still air, which led to the pollutants remaining trapped. A coworker of mine who lives in Paris described how this recent spate of high pollution has significantly affected her life. Each day, she consults an app that reports the air quality of Paris, and on days when it’s this high, she cancels any plans to go outdoors with her young son. It’s a sorry state of affairs when we are trapped inside by the very world we’ve labored to create. Categories: current events | Tags: air pollution, current events, france, global sustainability, le monde, paris | Permalink. This week, we both mourn the passing of Nelson Mandela and celebrate his mark on the world. There have been some wonderful commemorative pieces written, but I find myself reflecting on what “Madiba” and his movement have come to mean for global sustainability. You may not realize that Mandela’s anti-apartheid movement was actually the genesis of the modern Socially Responsible Investing (SRI) movement. According to my friend and SRI industry veteran Jed Sturman, firms in the 1990s followed the precedent set by the Quakers in the 1600s — who had looked to divest from holdings supporting or supported by the slave trade — in divesting from apartheid-supported South African investments. An amazing legacy of socially-responsible and sustainable investment has grown up since, from Ceres and its spin-off, the Global Reporting Initiative (GRI), to the drive to integrated reporting — social- and environmental value on the same annual report as financial statements. But I find myself reflecting more fundamentally on his tactics. Mandela was amazing not only for his perseverance in his cause of racially equitable democracy in South Africa, but for uniting the world behind it. He broke a dynastic system of privileged self-protecting wealth with his vision, inspiration, leadership, and moral imperative. We face many of the same entrenched system conditions in the tragedy of the commons of global climate change, with issues ranging from environmental degradation of natural capital to economic justice in developing nations. F. W. de Klerk — the last white apartheid president of South Africa, who released Mandela from prison and eventually shared his Nobel Peace Prize for ending apartheid — spoke upon Mandela’s passing that his greatest legacy was reconciliation for all races following his election as President. In our efforts, it’s easy to blame rich nations for polluting the most, or developing nations for raising their citizens’ standards of living through unsustainable means. Talks like COP and Rio+20 broke down on this hurdle. But let us instead remember that while neither our contributions to a degraded biosphere nor our suffering in a destabilized one are equal, the environment itself does not play divisive politics. Mandela taught us that his Africa was not black Africa, or white Africa, but One Africa. It’s a worthy reminder to us sustainability professionals: emissions aren’t rich or poor, toxic chemicals don’t speak different tongues, and growing deserts know no political boundaries. There is but one biosphere in which we all breathe, eat, drink, and mate. Only through a movement built on unity can we solve the greatest moral imperative of our generation. Categories: Inspiration | Tags: current events, global sustainability, inspiring, nelson mandela, socially responsible investing, sri, sustainable economy | Permalink.